Wood flooring has a warmth and texture that make it a popular choice for home owners. It can last decades (if hardwood) and is hypo-allergenic. It is also easier to keep clean than carpet. The disadvantage of wood flooring when you have pets is that it can be scratched by dog claws, and stained by spillages. Pet urine which can lead to a process of sanding and re-sanding which can become expensive to maintain. It can also be slippery underfoot for you and your dogs. Carpet is the most popular choice for home owners. We love the feel of soft carpet under our feet, and carpet has the highest warmth retention of all floor coverings. Unfortunately for dog owners it can become worn relatively quickly by dogs. It can trap allergens in the fibres which may cause allergic reactions to home owners and in some cases your dogs. Often touted as a good pet friendly flooring the ceramic tile is easy to clean and maintain, hardwearing and long lasting. Very popular in Kitchen installations due to its water resistant nature. It has long been a popular choice with dog owners. The one thing to consider with ceramic tile is the lack of slip-resistance for you and your dog especially when wet. Over the last few years research into dog injuries have found slippery floors to be one of the main causes of arthritis in dogs. 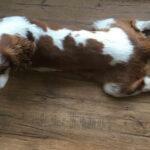 Damage from an early age caused by slipping can lead to decreased mobility in later life for dogs. 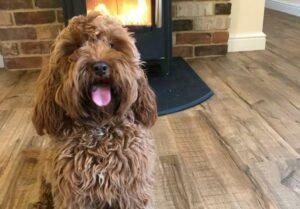 Once celebrated as the solution to pet owners needs for easy clean, low maintenance flooring this product thrived due to its low price and numerous designs. Still used today it is a popular choice for those who need a cost effective flooring solution. The negatives of the floor type is that it is prone to staining. Any harsh chemical used to remove these can bleach the colour – and leaks. This obviously has repercussions for dog owners who will have dog urine and water spillages from dog bowls on their floor. It is also very low on the slip-resistant rating. Rubber is a warm, comfortable solution for homes. Available in many colours and sustainably sourced. It has good slip properties, but is prone to scratching. It can be difficult and expensive to lay correctly. 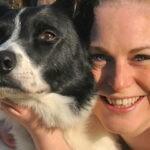 It is popular for dog kennels and dog training areas where aesthetics are not a priority. Some higher density rubber flooring is popular in homes, however dog owners may find the scratches to be prohibitive to specification. LVT has rocketed in popularity in the last few years due to the improved 3d printing technique which allows the floor to take on the look of wood, stone, and ceramic. It is also waterproof, stain-resistant, long lasting, and hardwearing. 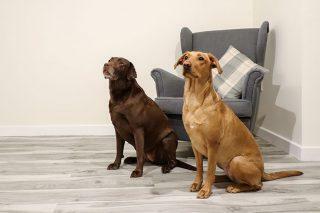 Officially: The world’s best flooring for dogs.Floors for paws has all the attributes of the LVT along with a double wear layer to negate scratching from dog claws, dropped items (those heavy dog bones!) and day to day wear and tear of busy households. It enables us to offer an extremely long domestic guarantee. Due to the ridged design it is also better than other LVT’s in terms of slip ratings (85 PTV BS7976). Giving better grip than others on the market. The 0.6mm wear layer is also stain resistant, so any dog urine, wine spills, and worse will not damage the flooring. It can be wiped clean without leaving a mark. 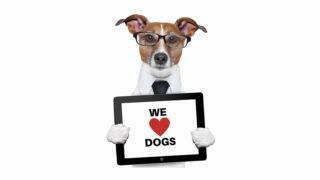 As dog lovers we also wanted dogs to benefit from our company. We donate 10% of every sale to Dogs Trust. Please visit our products and order your free samples.